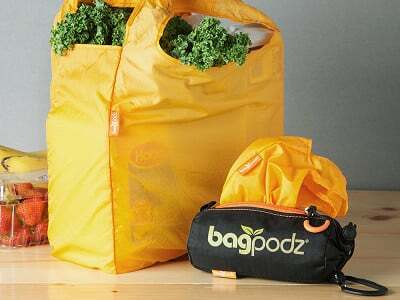 BagPodz is a reusable bag set that stays neatly packed and on hand whenever you need them. The bags come stuffed in a compact pod that fits in the glove box or under a seat in your car. A clip on the pod lets you attach it right to your grocery cart. At checkout, just unzip and pull out as many bags as you need. A second drawstring opening on the end lets you easily stuff them back into the pod. The bags are the same size as a disposable plastic bag but can handle much more. A flat bottom helps things like beverage cartons stand up more securely. Go ahead and pack them really full; they’re made of strong, rip-stop nylon that can hold up to 50 lbs. Even better, they’re Bluesign® certified, meaning they’re low-impact, eco-friendly, and sustainably produced to stringent safety standards. Water-repellent and machine-washable, this reusable bag set is also great for traveling. Keep dry and wet clothing separate. Or bring a few bags along souvenir shopping. Any time you want to use (and reuse) these bags, they’re organized and ready to go. 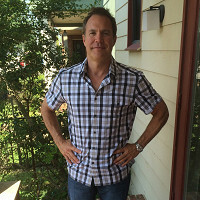 Big “hello" to everybody from Greg in Austin, TX! 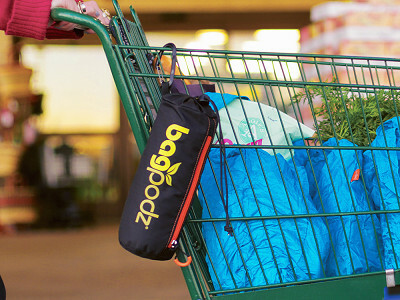 BagPodz is an easy, convenient, and compact system that eliminates the need for all the awkward piles of reusable bags most people carry around. You’re going to LOVE it! We’re happy to answer any questions you guys have for us today! Hello, This is Greg from BagPodz! Let me know if you have any questions for me about this product. I'll be here all day with answers! @jayne These are absolutely amazing! I was looking for something special for a friend's birthday and these are perfect. My only dilemma ... which one to choose for her (and of course which one to choose for me). We are both "bag queens" so we must have these LOL. Can you tell me where this product is made? @jayne Can you tell me where this product is made? If you click on the button to buy them, under “Details” it says, "Made in Vietnam"
Hi This is Greg - yes they are made in Vietnam in a Bluesign certified factory! The BlueSign certification guarantees that the factories meet stringent requirements for everything from makeup of materials to worker safety. Rita, you will love this product :-) It's really cool the way the bags always come out one at a time through the zipper. When you are at the register in the store, they pop out one at a time like tissues out of a box. You you just take out what you need and the rest are still stored for next time. When you get back home, stuffing them back in is just as easy. Hi Doris, we understand some consumers adhere to a Made in the USA shopping list and we encourage you to shop our Made in the USA collection here, but see Greg's answer below in regards to a similar comment. It's pretty enlightening! 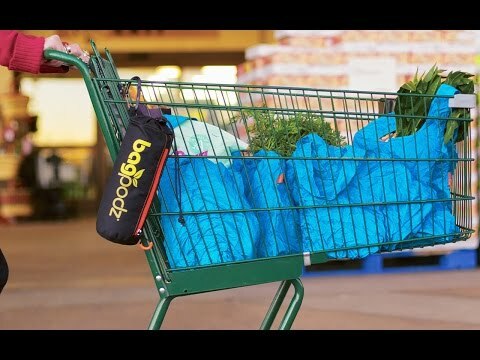 "BagPodz was designed and developed in Austin, TX and while we would have loved to produce our bag system in the US, after much searching around we found it just wasn't possible at this time. There aren't systems in place here in the US for the kind of production we needed and if we were to start up our own production the cost would be far higher than anyone would want to pay for the product. So, we went with the next best thing. We are producing in Vietnam and, as factories adhering to the BlueSign standards, their standards are as good as they would be in the US. We're helping to boost the economy which is growing rapidly these days in Vietnam after many years of hardship in that part of the world." I hate to rain on Grommet, but these are available at amazon.com with free shipping. Not to mention that the ones at amazon say they come in a 6 or 12-pack, not the 5 or 10 offered here. Thanks for the comment, Roger, but I'm actually going to send that rain right back to you. Greg can correct me if I'm wrong, but BagPodz no longer comes in 6 or 12 packs, just the 5 and 10 you see here on site. Not to mention searching "BagPodz" on Amazon yields zero search results. Yes, Roger - Mike is correct. BagPodz is now sold in 5-packs and 10-packs. This was done for a couple of reasons. The main reasons being cost and quality. 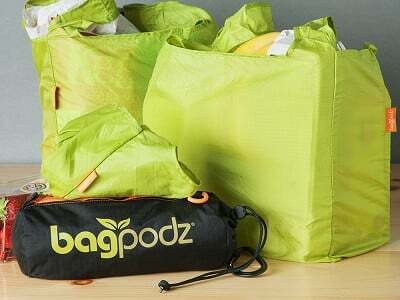 If you open up a BagPodz, take out all the bags and spread them out on a table you can see that it is a very large amount of material in one BagPodz. The RipStop nylon material we use is by far the best in the industry which makes for really strong bags! But it's also very costly. So, to be able to keep prices lower we decided on a 5 and 10 count rather than lowering quality which we just wouldn't have done. The bags can hold a quite a bit in each one too. You can really load them up. The 5-pack is plenty of bags for those that go to the store more frequently and the 10-pack is perfect for larger families or those who shop once a week or less. The 10-pack will hold a full grocery cart's worth of groceries. I did find a 6-pack lingering around at my local Container Store before I saw this on Grommet. I think for a 50-pound carry weight and the amount of material, that a 5- and 10-pack is sufficient. Honestly, I wanted more than 6, but really didn't need 12 at this size. I can really load up a cart at my local ALDI, and 10 of these more than does the job. LOL! Well, my comment was true at the time I posted it. I have a 6-pack on order for $19,95 with free shipping. There were three 12-packs listed at that time also which I see are no longer listed. Maybe others saw my comment and snatched them up? In any case, as much as I like Grommet, it just goes to show you should shop around before buying. @Barbara Hi Barbara, BagPodz was designed and developed in Austin, TX and while we would have loved to produce our bag system in the US, after much searching around we found it just wasn't possible at this time. There aren't systems in place here in the US for the kind of production we needed and if we were to start up our own production the cost would be far higher than anyone would want to pay for the product. So, we went with the next best thing. We are producing in Vietnam and, as factories adhering to the BlueSign standards, their standards are as good as they would be in the US. We're helping to boost the economy which is growing rapidly these days in Vietnam after many years of hardship in that part of the world. Thanks very much for that info, Greg! It's a bummer more opportunities for U.S.-production aren't available, but hey, you're helping put the Maker in Maker Movement, so hopefully doors open up in the future! I hadn't heard of BlueSign standards before, but it answers some of the questions I had about the manufacture of these bags. I'm really glad to learn about this and happy to know the bags are being made under safe conditions for the workers. I wil be ordering some as gifts (and some for me as well). Glad to hear it, Debra! Enjoy! Hi!! It's inevitable that the things you put in the bag or where you place the bag can get these bags dirty. Are these bags machine washable? @Leizl Hi, yes the bags are absolutely washable and we encourage it. They are super easy to take care of. In fact, after going through the spin cycle in the wash they come out almost dry because in addition to being washable they are water repellent. Can I buy a large set with 2 small sets and them mix them up a bit? Thinking of gifts but a mix of bag sizes would work best. @Guest Sure! Some people like to do that to mix up the colors. The 5-packs and the 10-packs all have exactly the same size bags inside and the same color choices. If you buy multiple sets you can mix 'em up however you like. @Greg I guess I am confused. The dimensions given on the description for the 5 bag set are smaller than those given for the 10 bag set. The only reason we don't offer a "mixed" color set is that BagPodz is a bag system. The bags always come out one at time because they are pulled out from the middle when you zip open the side zipper. We thought if people were trying to pull out one certain color they might be digging around in the sleeve for a particular color and mess up the one-bag-at-a-time delivery system - by having to pull out several bags to get to the one color they are looking for. But for customers that just want a variety of colors I say go for it and mix it up. Hi Guest, the dimensions for BagPodz refer to the pod that holds the bagz. The Bagz themselves are about 12" x 12" in the front and back and the depth is 4.5" on the sides and bottom of the bags. Great idea. I like the heavy load capacity as I like to load 4 2 lt sodas into a bag. My wife will be thrilled. @Dave , Pretty sure that is the size of the pod that holds the bag. Too small to be bag sizes. @Dave Yes, Dave, the ripstop nylon is ultra strong and we did things like strong French seams to insure bag integrity with heavy loads. In fact even though we don't advertise it we done some serious destruction testing and can't break them. We've tested the bags up to 100lbs without breaking and we've done things like put our foot in the bag and pull with all we've got on the handles. All without breaking the bags. @Dave Yes, 4 - 2liter sodas should fit nicely in a bag. I haven't tried that myself yet but we've tested it with 8 bottles of wine in one bag or 2 gallon jugs of milk and they still have room to go. Hi Greg: I am wondering if you will be selling bag refills? If I find that 5 bags are not sufficient for my needs, will I be able to purchase additional bags only? @Donna Yes, additional bags can be purchased separately. The BagPodz sleeves though are designed to accommodate the number of bags they are sent with though - 5 or 10. If you think 5 may not be quite enough I really suggest you go for the 10. It's better to have a few bags in reserve than not quite enough. I live in CA, and we've been having to bring our own bags for several years now where we live. One question..WHAT TOOK YOU SO LONG??!! Both of our cars have loose bags all over, it's awful. I never know how many to bring in, and I almost always end up having to buy another, because I don't want to hold up the line. Better late then never! I bought the 10bag one. If this works out for me, I have a good idea what I'm going to be sending as Christmas/Hanukkah gifts this year! Why?Why? Why did you wait to invent this? MAN! Hi. In the picture where the yellow bags are shown looks as though handles are along the long side of the bags. Video and other colors show then on the shorter side of the bag...the sides vs. front. I like the ones with handles along the fro t as in the yellow picture. Also appear shorter. Can you tell me which is correct picture for product? @Cindy Hello Cindy, the bag handles are a continuous extension of the front panels up to the point where they are sewn with doubled up material for the handles themselves. The handles are an extremely strong integral part of the bag itself. We also designed the handles to be long enough so that if you want to bow tie the handles on the ride home you can certainly do that. Hi Cindy, that is sort of an optical illusion. The handles are on the sides of the bag for all of them. The picture of the yellow bags you are referring has the handles on the sides and bending toward each other giving the appearance of one handle in the front, but really they are two on the side. The size of the bags confuses me. Are they 12" long, 4.5" wide, and only 4.5 " high? That isn't high enough to cover 2 gallons of milk or several wine bottles, as pictured on your order page. Hi Ilene, thanks for the question. Your confusion is justified because my answer was confusing. The front and back of the back is about 12" x 12" and the depth is 4.5" on the sides and bottom of the bags. @Ilene Hi Ilene, the pictures shown of the two gallons of milk side by side and the 8 bottles of wine in a bag are definitely representing what each bag can hold. The front and back panels are about 12.5" and the side panels are about 5.5" But because it's not a rigid bag they can accommodate many sizes of things. You can even see a picture where it is holding 6 or 7 full-sized (and prickly) pineapples in one bag. @Emily Hi Emily, no need to be careful with 'em - our bags can take a lot of abuse due to the ripstop nylon we use to make the bags. It's parachute and sail material. As far as the size of our bags I think you'd really like them. They don't look that much bigger than the old crummy disposable bags grocery stores have been giving out for years. But they hold about double what those disposable bags hold. We sized them so were not like the enormous single reusable bags you see for sale out there. We wanted customers to be able to separate their groceries into multiple bags so that frozen is one, cans and things in another, bread and chips in another and so on. Separating groceries is so much nicer than cramming it all into one bag where fragile items are crushed and frozen or cold things get everything else wet. @Greg I believe she's asking about getting some that are sized for fruits and vegetables (produce bags), which would be smaller than a normal grocery bag. Yes, Laura is right, the smaller thinner fruit & veggie bags that the store provides are the size I'd love this concept for. I could use them at my grocery store and at the CSA I pick veggies up at during the summer. The fact they are nylon makes them perfect for this because most veggies are wet when you bag them up to purchase. I reuse the store veggie bags but they can't be washed like these could. Nice to just clip a wad of them onto the cart for easy access too. Convenience, efficiency, and sustainability in a convenient pod. Doesn't get much better. Thanks for the comment, Emily! Absolutely LOVE this idea! Hate having to tote different size bags into the market and trying to figure out how many I really need. I love that this allows me to carry up to 10 in one easy carrier! I'm doing my Christmas gift shopping and getting these for my sisters! I can see myself forgetting to remove the Pod from the cart. Is it light enough to maybe hook onto a belt loop of jeans or a jacket? @Cate Hi Cate, YES! It's very lightweight and you can hook it onto your belt loop or a jacket or a backpack or a handbag. The sleeve is extremely tough ripstop nylon too. You can shove it under the seat or cram it into any nook and cranny without damage. and dirt just brushes right off because the sleeve itself is waterproofed as well. I LOVE, LOVE, LOVE my bags. I am not that person carrying in an armful of random bags.I simply click my 5-bag pod on the side of my cart and I am good to go! I really should be a spokesperson for Greg, or at least get a portion of the sales! I tell everyone! I purchased my orange pod o'bags at the Wimberly Market Days and I have not had a messy trunk since then! The bags are easy to wash and no plastic bags to throw away. Everyone on my Christmas list will be receiving a pod from Santa this year!!! @Greg Why is the shipping so high? $10.98 (est) for the lowest cost shipping, and this probably weighs in under a pound. I'd buy this in a heartbeat, but not when the shipping is almost 50% the price. Hi Mary, thanks for the comment! That shouldn't be the case unless you are looking for priority shipping. I calculated shipping to Alaska and it was under $5. Let us know if the problem persists and we will look into it! Great idea! So, the details says that each bag is 12" x 4.5" x 4.5". Is that correct? It sounds odd to me, but I thought I would ask. Thanks much. @Douglas Hi Douglas, it's really about 12.5" on the front and back panels and 5.5" on the sides and bottom but since it's ripstop nylon those aren't hard and fast dimensions. The bag accommodates a big variety of shapes and sizes when you start loading it up. And the flat bottoms make loading groceries really easy. Those dimensions also do not include the handles which extend up from there. Hi Douglas, not quite. The front and back of the bag is about 12.5" x 12.5" while the sides and bottom are about 4.5" wide each. We will make the correction in the details! @Mike is there a difference in size between the containers for five and ten sets of bags? Not of the bags, Lynore! The only difference in size is in the pods that hold the bags. The one that holds ten is obviously a little bigger. This is the best product! I have both sizes. Every time I use them, people want to know where I got them from. They fit great on the store's bag racks so they are easy for the baggers to load and they hold so much stuff! I have put some really heavy juice and milk bottles and no problem! I usually use the bigger pack, but I don't think I've ever used them all at one time, not even for a Walmart run. They wash great too. @Jennifer Thanks so much Jennifer!! We've been hearing from so many people get asked that same question at the stores - "where did you get that?" It's so different and solves the problem with regular reusable bags so compactly and conveniently, hah! And yes, the bags do fit on the old racks that used to be for the plastic disposable bags. The cashiers love them because it makes our bags so easy to fill at the checkout - especially on those big bag carousels. Thanks again for your awesome feedback! Exactly the kind of idea that I'd expect from Austin, TX! Great product. Great idea to add the snap link for the basket. Super idea to have it load on the end, but zippered so you can EASILY reach a BagPodz to remove one or more at your second or more shopping stop of the day! Thank you so much for your very cool feedback! As the official motto for Austin goes - "Keep Austin Weird" - Gotta love this town. Before I retired, my firm was selling a similar item about nine years ago. The main difference was we were imprinting the bags with a client's logo. We never sold retail. @Bob Thanks for the good wishes Bob! 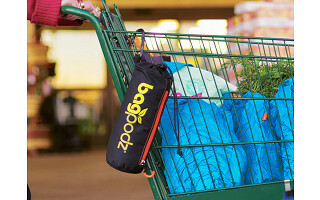 @Debra Hi Debra - well this very cool site is reserved for retail customer sales - but for wholesale opportunities you'd want to contact BagPodz directly. Thanks! @Debra If you are retailer, check out The Grommet Wholesale options. Over 400 of our Makers are on our sister site. Click on the link at the bottom of this page. We will be more than happy to be working right away with The Grommet Wholesale to make that happen. It would make for a very streamlined and easy process for retailers to take advantage of. Hello Greg in Austin, TX! I'm Angela in Toronto, ON, CANADA! Why don't you deliver to Canada????????? Hi Angela, I'll refer this question to The Grommet guys but I believe even though they don't directly ship there there is a third party way to ship there called Bongo. If you go to their "customer service" link at the bottom and then to "shipping" it's one of the questions they answer. Greg is absolutely right, Angela! And that link is right here! Notice there's already been lots of commenting on these but since I've used them since last Christmas I thought I'd chime in and say "buy these!!!" They are so cool - all the bag handlers at my local grocery love how much stuff they can get in them. And when they want to put the meat in plastic I can just say "no, they wash and dry easy." Just throw them in with your other laundry and hang on the washer door or a door handle and they dry in short order. My sister actually bought my son and I sets from Greg in Austin and we are both in love with them. The craziest thing is that just the other day I actually thought about Grommet and that they should feature Bagpodz - great minds think alike! Hi Ella, thanks so much for your comments!!! I'm very happy you really like them so much! All the hard work and sweat of designing, producing and launching a new product is starting to come to fruition. :-) It's funny that you were thinking we ought to be on The Grommet too. I've had a couple of other people that bought BagPodz recently just tell me -out of the blue- "Hey, you know, you ought to have your BagPodz on The Grommet. Well, here we are!! Great minds indeed, Ella! Thanks so much for the great testimonial! At first, I didn't like how big that picture is, but you know what, Ella, I agree with you so much I'm cool with it. Thanks again! Hopefully it doesn't break anything.